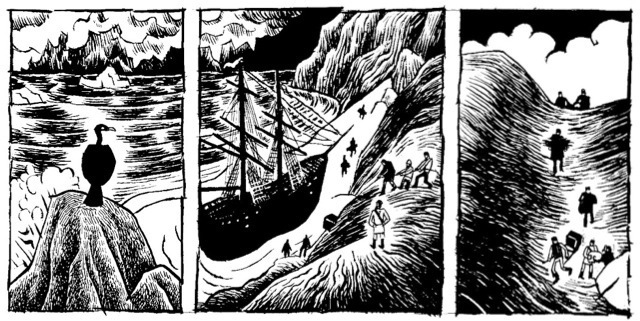 The adventurous graphic novelist T. Edward Bak is coming to Kutztown University to speak about another adventurous explorer from the 18th century. Bak’s ‘Wild Man’ tour includes stops at the Center for Cartoon Studies in Vermont, SAW in Gainesville as well as KU. The KU event is Free. Boehm, Lecture Room 261, Tues. Nov. 19 at 7:00 pm. Bak, who now calls Portland, Oregon home traveled to Alaska’s Aleutian Islands to research “Island of Memory.” The 72-page graphic novel is based on the adventures of the German naturalist Georg Wilhelm Steller. Steller worked on the ill-fated Russian expedition led by Vitus Bering that explored Alaska in 1741. Steller discovered a number of species of birds and animals unknown to Europeans. The Steller Sea Cow became extinct within a 25 years of his initial description of the docile beast. The Steller Jay, though, is still common on the Pacific coast. It’s similarity to the American Blue Jay led Steller to rightly conclude Alaska was not an island, but part of the North American continent. Bak’s Island of Memory presentation touches on art, ecology, geography and the humanities. The event is co-sponsored by Kutztown’s Modern Language, Geography, and Communication Design Depts. A book signing will follow his illustrated presentation. Next > Daniel McCloskey, Smiling Artist Missing Teeth. Hi. I’m the author of this work and am obligated to correct a couple of errors in the post. The Second Kamchatka Expedition took place during the 18th century, not the 19th century, therefore the exploration at sea occurred from 1741-1742, not 1841. Steller was a naturalist and Bering’s personal physician, but he was not an artist (that we know of) and is not listed as a “ship’s surgeon” on the St. Peter’s roster.